If you own a chain of nail salons, get ready because California regulatory agencies are setting their sights on you. After several years of targeting retail establishments like Lowes, Rite Aid and Walmart for BIG FINES because of shaky hazardous waste disposal practices, the State of California and the Department of Toxic Substances Control (DTSC) has shifted its focus to hazardous waste disposal for nail salon chains. Recent legislation sponsored by Assemblyman David Chiu and signed by California Governor Jerry Brown, Assembly Bill 2125, creates statewide program guidelines to help cities and counties incentivize nail salons to use products that are less toxic and to adopt practices that are safer for their workers and customers. This is the first step in “cleaning up an industry” that has developed a reputation for being unhealthy for both customers and salon employees. While the focus of this recent legislation is aimed at protecting workers and patrons through outreach and advocacy, the message should be clear. Clean up your act or else!! Many nail salon owners do not know or choose to ignore the fact that the common materials used within their businesses are regulated as toxic substances. While nail polish is generally deemed safe enough for everyday usage, these materials require special disposal precautions. Countries across the globe categorize nail polish as a hazardous substance because it is highly flammable, and because some of its ingredients (toluene and formaldehyde) are linked to major health problems. The flammable ingredients in nail polish include nitrocellulose cotton, lacquer and more. The acetone or ethyl acetate solvent found in nail polish remover is also extremely flammable. Ignitability is a key defining characteristic for classifying a substance as hazardous waste. When these hazardous materials are disposed of into municipal garbage cans, old nail polish and remover can harm sanitation workers. And if you dump it down the drain, polish and remover can contaminate septic systems and entire watersheds. Simply put, these materials should NEVER be disposed of in a regular garbage can. If you are currently doing this, you could be putting your business at risk for significant fines. Nail salons that produce hazardous waste as part of their operations have a complex web of federal, state and municipal statutes to follow in order to properly handle and store these waste streams. Improperly handling toxic waste could release harmful chemicals into the air, groundwater, or soil, posing a serious threat to your employees, the environment and any surrounding residences. AB 2125 originated in the San Francisco Bay Area several years back. Asian Health Services, a community clinic in Oakland, started The California Healthy Nail Salon Collaborative after the clinic identified a pattern of illness among nail salon workers. 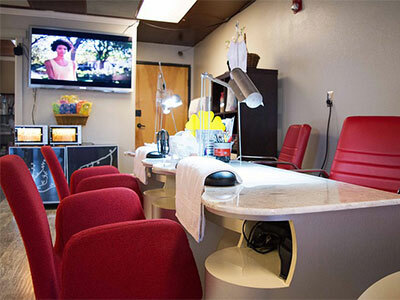 The mission of the collaborative is to convince nail salons to adopt safer business practices. Nail salons that participate in the collaborative must make significant changes to their business, including buying less toxic nail polishes, thinners and removers. All workers are required to wear specific types of gloves and masks when using certain products. Owners are also required to purchase a portable mechanical ventilation unit. The process, however is not cheap. Salon owners that participate in the program say that “safer” products required cost about 30 percent more. Many program participants need to raise prices to recoup investments made to come into compliance. Salon owners should brace for further intervention by the DTSC in the coming years. Salon chains should be especially vigilant with their hazardous waste disposal practices, as the state frequently targets larger chains to send a message to smaller outfits to clean up their act. Expect big fines and costly operational changes if the DTSC comes knocking on your door. Businesses that use large amounts of nail products should contact a hazardous waste disposal company for proper disposal.